I finally finished the big craft room clear out today! Boy did it take longer than expected! Sorting the scrap box was a bit of a nightmare. The room feels so much bigger and lighter now though, ready for the new year!! I haven't actually made any new cards yet but I can share some of my Dirty Dozen Splitcoaststampers cards from September. 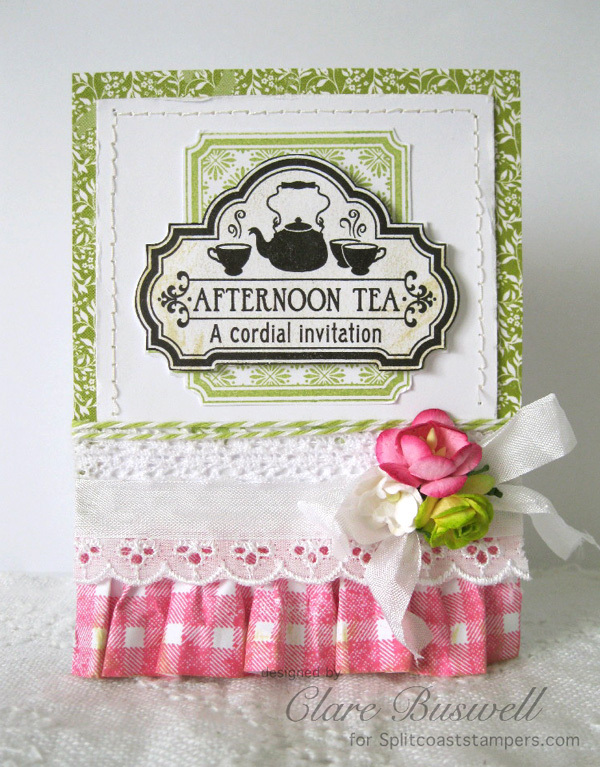 I love this first one with stamped gingham paper frill, I used the Gingham & Co stamp set from Waltzingmouse Stamps and Memento Rose Bud Ink. The label is from Afternoon Tea also Waltzingmouse Stamps, stamped twice, once in black and once in VersaMagic Tea Leaves. The flowers are from Wild Orchid Crafts. A little bit of patchwork paper piecing using papers from Lost and Found Two Sunshine from My Mind's Eye and Random from Crate Paper. The label I stamped using Very Vintage Labels No.4 from Waltzingmouse Stamps. The sentiment is from Hero Arts. I love the bit of black teamed with this one. Lots of lovely texture in this one with some corrugated card layered with a label stamped using Holiday Labels No.14 using VersaMagic Sage ink. The sentiment is from Fancy Phrases by Waltzingmouse Stamps. The leaves I stamped using the polka dots from Gingham and Co. and then stamped using the leaves from Roses in Bloom. The flowers are from Wild Orchid Crafts. Outstanding crafty offerings once again. I am amazed at your robust crafting mojo. Mind telling me where I can get some? ;-). I just love all your beautiful cards. The first with the paper flounce is so beautiful. The chair card is simply dynamite. I am trying to get my head around making one but alas I can't seem to work it out. Lucky I am content with just admiring yours. Spectacular cards! Oh they are all so beautiful but I do particularly like the pink gingham ruffle -I heart it!!! Lovely cards - I particularly like the first one! I have to tidy my craft room over the next couple of days - 'tis a mess!! Happy New Year Clare ... Love these cards but your chair card is totally amazing!! OMG ... 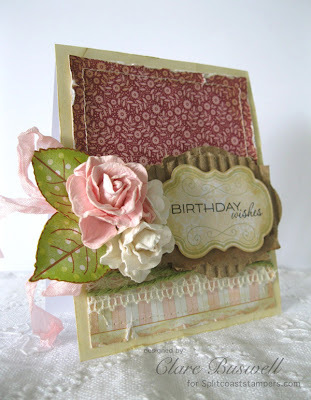 I adore the pink gingham paper ruffle on the first card, Clare! Super sweet and I love pink and green together - WOW!! These are all GORGEOUS, but the chair card totally blows me away, simply awesome!!! Wonderful cards! 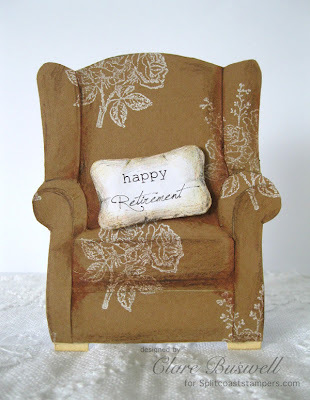 That chair card is so cute and unique! They're all wonderful!! Love the first tea card and that couch is fabulous! These are all stunning Clare, a gorgeous selection of cards. 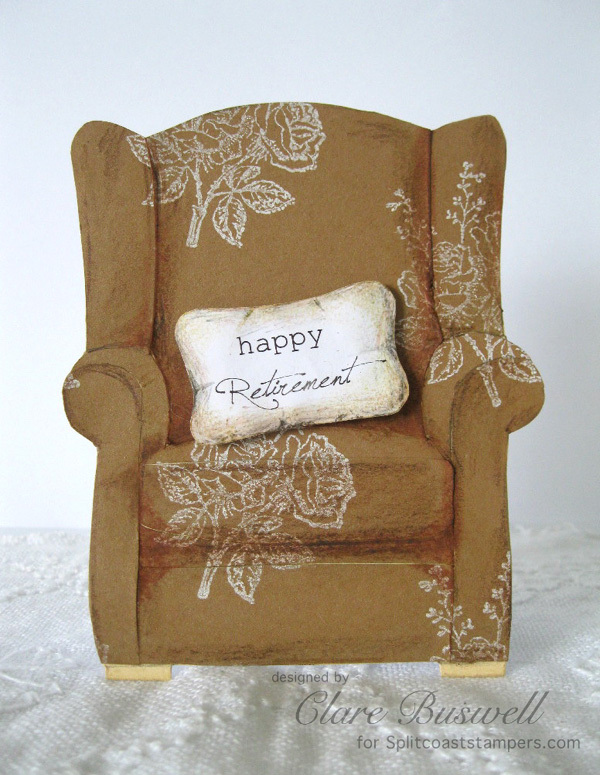 Clare, I love the Happy Retirement chair - it really made me smile! SRM Stickers 2012 Design Team! !